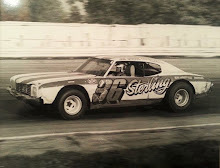 Du Quoin, Ill. (August 29, 1976) - When they began the 100-mile USAC championship dirt car race at the Du Quoin State Fair, it looked like it was going to be Tom Bigelow’s day. Bigelow, the 1975 Du Quoin champion, shattered the track record in the qualifying round by zipping around the one-mile oval at 109.20 miles per hour. Once the race began, it continued to look like Bigelow’s day. 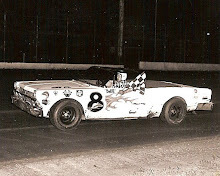 But when the race ended, it was a relatively unknown racer by the name of Norman “Bubby” Jones in victory lane collecting the kisses, trophy and first prize money of $9,000. Jones, a barber from Danville, Ill., started the race in the third position behind Bigelow and Pancho Carter. Bigelow led the first 20 laps of the race plagued by two accidents. Carter led for 26 laps. The fourth fastest qualifier Joe Saldana led for 12 laps and Jones led for the final 32 miles. 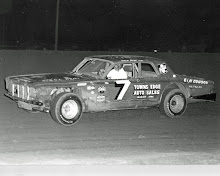 Bigelow, driving the Leader Card Racer, was sailing along with a sizeable lead over runner-up Carter when the race was stopped on the 15th lap because of an accident involving Sleepy Tripp and Jackie Howerton. Tripp’s car went over the turn three wall and it took about a half hour to repair the damage to the guard rail. Neither Tripp nor Howerton was injured. Carter managed to stay with Bigelow on the restart and then passed him six laps later. Pancho sailed along in fine fashion for 20 laps. 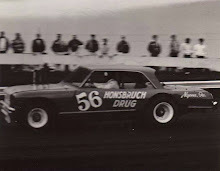 Then he caught the cars at the back of the pack, got in heavy traffic and collided with Roy Hicks. The accident occurred in the same third turn as the first collision. Both cars were heavily damaged but neither driver was injured. Again the race was stopped and again it took workers about a half hour to get the track in shape for the restart. With Carter out of the race, Bigelow, who was running second at the time the race was halted, should have been at the head of the field when the cars pulled back out of the pits. But Bigelow couldn’t get his car started until a lap later after the restart. 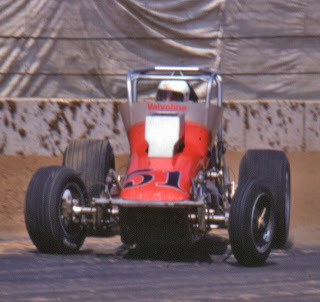 That gave Joe Saldana the lead with Jones second and Larry Dickson third. Saldana led laps 47 through 58. He made a pit stop on the 59th lap that allowed Jones to take the lead. Jones was hard-pressed by Dixon for the remainder of the way but never relinquished the lead. 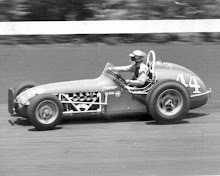 Veteran USAC driver Jim McElreath finished third while newly-wed Larry Rice was fourth and Johnny Parsons was fifth. Parsons drove a brilliant race. He started 23rd in a field of 24. He got up to third place in the late stages of the race but dropped to fifth after his engine started acting up.